There's nothing boring about this flavor-packed salad! 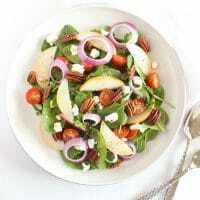 A bed of baby spinach is topped with crisp pears, juicy tomatoes, crunchy red onions and pecans, and creamy goat cheese, and tossed in a bright and aromatic lemon thyme vinaigrette. In a large mixing bowl, add the spinach, pears, onions, tomatoes, and pecans, if using. Toss with dressing and divide evenly among 4 salad plates. Top with goat cheese and serve. If vegan, eliminate cheese and swap maple syrup for honey in dressing.